I first saw the Architecture theme in a LEGO store, and I was very impressed. The boxes are extremely professional looking, in fact, I would build the set, and display both the set and the box! Overall, the set looks good but it is very small, so it would work well as a display on a smaller shelf. In general, LEGO Architecture sets work well for LEGO collectors who have limited space, and don't want to buy/display larger structures like the Tower Bridge or Taj Mahal. The only unique piece in this set is the black 1 x 8 name plate in the base of the set, which reads "Empire State Building". This piece alone goes for $6+ new on BrickLink. The rest of the pieces can be bought easily from the Pick A Brick website for about $10, or from BrickLink for $7-8, since these are very common pieces. Below is a picture of the name plate. As you can see, this build is very uniform in how it is built, and is extremely solid, in that it is structured and built like an actual building. First of all, the Price Per Brick in this set and the Architecture theme in general is dreadful. For this particular set, the Price Per Brick is $0.26, which is 2-3 times more expensive than your average set. Because the series is geared towards older builders, price definitely isn't as much a concern as it might be for a set geared towards younger children. Either way, this set should not be used to part out, unless you can buy it for lower than around $8, because it will be hard to make your time worth it because of the wide accessibility to the pieces in this set. The Architecture theme is probably only average in terms of popularity (though only LEGO knows how the theme truly stands up agains other themes), but based on the quantity sold of each set, we see only average or even mediocre popularity, with only about 30 sets sold per month per set. These sets as an investment have done really well, which shows demand for the sets in the future. I think these sets are under-the-radar, especially the smaller ones, so 9/10 for theme popularity. From what I know, this set isn't exclusive to any store, but most don't carry the sets in-store, because it doesn't sell in high numbers, and doesn't appeal to most children who shop in the LEGO aisle. I'd give this set a 8/10 for this reasoning. Though it isn't exactly a LEGO exclusive, there aren't very many sellers of this set, which makes it slightly more difficult to buy this set. I absolutely love the packaing on the LEGO Architecture sets, because it appeals to a huge AFOL population, with the more mature design, and actually reminds me of Apple's boxes, which are a solid color with minimal design and color. On the side, there is the signature of the designer, Adam Reed Tucker, a designer from Chicago, hense the first 2 sets being Chicago based. Inside the set is a basic guide to the actual building, with information on the history and design which great for educating the consumers of the sets. I definitely think that doing this helps to draw additional adults back into LEGO. 10/10 in packaging. The two sets that were first released in the Architecture theme, back in 2008, retired recently and so far, they have performed impressively. The 21000-1: Sears Tower is retired, but was quickly re-released as the 21001-2: Willis Tower, after the name change, but has since climbed to 2x above retail, which is impressive considering the only difference is the name plate and a number and word on the box. The second retired Architecture set is the 21001-1: John Hancock Center. Thus far, there are a handful of sold listings for this set that have broken the $100 mark which makes the Return of Investment over 400%! That's super impressive for a $20 set. To give a more recent example of an Architecture investment success story, we have the 21010-1: Robie House, which retired only a few months ago. The set has one of the best Price Per Brick ratios in the entire theme, at only $0.09 and retailed for $199.99, and was widely available for as low as $120 on Amazon. The set is already selling for $40+ above retail on eBay, and probably will hit $300 by next year. I think that based on these investment values, we can safely assume that the theme offers great potential investment wise, so 10/10! As I said in the introduction, I really like the Architecture sets because of their size, which allows you to display more of them, rather than having to build a shelf for a set like the Tower Bridge. Visually, this isn't too imposing of a set, but it does its job well and is very accurate and recognizable. Even if someone doesn't know right away, the name plate definitely will help them out! I think these sets are meant to be displayed, especially because of their name-plate that each set comes with, which is similar to the plate LEGO Star Wars Ultimate Collectors Series sets come with, with basic biographical information about the build, except there isn't any information on the plate itself, rather the information is found in the information booklet that comes with the set. I first saw this set prior to seeing the movie, so I was slightly confused by the set, but not as much as a few of the other sets, as you might have noticed! This set reminds me a lot of a battle pack, priced right at the $12.99 mark, and with a few collectable minifigures. It isn't so much a battle pack because you get actual characters rather than generic soldiers, but has many of its traits. This set is great because you get some of the main characters, plus a Robo SWAT minifigure. My first impression of this set after seeing the movie was something along the lines of "Ohhhh....I get it now!". Most of the sets tend to "click" after seeing the LEGO Movie, and this is not different. This set is particularly easy to recognize because it takes place in the beginning of the movie and the scene has a lot of tension. The second rare piece is a 1x2 piece that looks like two corner pieces smashed together. This piece is actually pretty cool because a minifigure's legs fit right on it, and each foot gets one compartment. At this point, I can't think of any great uses, but it is a cool piece. EMMET, the protagonist/hero of the LEGO Movie is naturally a fairly common minifigure in the LEGO Movie, in fact he appears in this exact version in 5 other LEGO Movie sets out of a total of 14 sets that have normal production runs. Obviously a very recognizable minifigure, and his minifigure is double-printed to include a confident smirk and a scared screaming expression on the other side. We also get the Piece of Resistance attached to Emmet via a back-plate, which allows you to build perpendicularly to the minifigure. WYLDSTYLE, the female protagonist and accomplice of Emmet is exclusive to this set, but only because of her hood, which we get a nice, long view of at the very beginning with Emmet's speechless dialogue with her. The hood is the only part that distinguishes her from other versions. Once again, obviously movie accurate, since the movie is just as much based on the LEGO figure as the figure is on the movie. This minifigure comes with printed legs. ROBO SWAT, is one of the many minions of Lord Business, but this particular varient is unique to this set. Lord Business' minions could be compared to Clone Troopers in Star Wars, with different "specialists". In the LEGO Movie, we see different kinds including: Deputron, Executron, Radio DJ Robot, Robo Skeleton, Sheriff Not-A-Robot, and 5 seperate versions of Robo Swat, who could be seen as specialists. I haven't personally built this set, but it looks like a 3-4 minute build for an AFOL (Adult Fan Of LEGO), and a few minutes longer for a child or amateur builder. By no means a difficult build, though there seem to be some more complex pieces in the construction of the chair that Emmet stands in, it is overall pretty easy. I can see this being a very popular set after retirement, assuming the LEGO Movie stays popular in the future. Definitely not as rare or in-demand as some of the other LEGO Movie sets that are more expensive, but I could see this being a $20 set 2 years after retirement, assuming we don't get a remake, which I personally think is unlikely. When compared with other LEGO Movie sets, this set actually has the second highest Price Per Brick ratio in the theme, but for smaller sets, this is to be expected. This set isn't a great "parter-outer" set, because the minifigures don't go for very much on eBay, and the rest of the build doesn't have much of an appeal. Therefore, Overall this set gets a 7/10. At this point, I think the LEGO Movie theme is popular because the movie has just recently come out, and the DVD and other merchandise are still being released. In the future though, I think the popularity will significantly decrease, probably until the next movie comes out. I can't imagine this movie being as popular in the long term as other LEGO themes including Friends, Ninjago, and even Legends of Chima. 9/10 in current popularity, and 5/10 in future popularity, so overall, a 7/10 in Theme Popularity. This set has a normal production rate, and isn't exclusive to any store. To my knowledge, the set isn't restricted to any country, and/or store. So far, the set seems to be on a normal production cycle and will probably retire in a year and a half, so nothing special there, and fairly normal. Therefore, this set get s a 5/10. This is a pretty small set, and the set is about as big as one of the older battle packs, but slightly thicker. Its exact dimensions are 15.7 cm x 14.1 cm x 6.1 cm. As seem above, this is a pretty cool looking box, with a fairly nice background and a sort of secret agent feel to the box. Other than that, there isn't anything unique about this box, so I give the packaging a 7/10. As stated before, I don't think this set will do as well as other LEGO Movie sets in the future, and probably will get to $20 in 2 years, which is really only a 53.89% ROI over that period of time, and there are many other sets in the theme that could offer more in terms of investment. One of the smaller sets I think is similar in price and has better investment potential is the 70803-1: Cloud Cuckoo Palace, because it is more popular, and more unique. Bad Cop's Pursuit will also probably do really well after retirement, if you are looking at other LEGO Movie sets. Overall, a 7/10 in terms of investment. A pretty good display set, though it isn't terribly large. It would work well as a small shelf or office desk display, but on the larger scale, I'd look to other sets that offer more in terms of space and size. I'd probably choose most other LEGO Movie sets over this one to display, primarily because of the lack of size in this build. Overall, a 4/10 in terms of display. Overall, a sub-par set in many aspects of the set, including display and investment, but it does meet expectations in terms of pieces and their rarity. In my opinion, this set receives a 6/10 overall. Launch an ambush attack on the Sauron Army from the Pirate Ship! On the shores of Minas Tirith, Sauron’s Mordor Orcs prepare to greet their allies aboard the Pirate Ship – but all is not as it seems. Pull up alongside them, drop the anchors and lead a surprise attack with Aragorn, Gimli, Legolas Greenleaf and the Army of the Dead. This majestic Corsair ship features 3 large sails, removable rear section with dungeon and Pirate of Umbar prisoner, firing crossbow and loads of armor and weapons! Capture the Orc catapult and lead the glow-in-the-dark King of the Dead and his soldiers into battle at the War of the Ring! Includes 9 minifigures with weapons and accessories: Aragorn, Legolas Greenleaf, Gimli, 2 Mordor Orcs, the King of the Dead, 2 Soldiers of the Dead and a Pirate of Umbar. • Lock up the Pirate of Umbar so he doesn’t escape! • Fend off the Orcs with the crossbow! The Lord of the Rings Pirate Ambush set is a huge set (third largest in the Lord of the Rings theme, not including Hobbit sets), is probably more memorable and iconic than many of the other larger sets in the theme. I'd argue that it is a better set than the Mines of Moria (9473). Upon first impression, I was fairly impressed by the set. With 756 pieces, and a design that is reminiscent of old Viking ships, this set definitely has a lot to offer. It is massive in size, and there are quite a few collectable minifigures included in the set. There are nine minifigures, five of them exclusive, including the King of the Dead, and two Soldiers of the Dead. This set comes with 9 minifigures, 5 of them exclusive to this set! This makes a lot of the minifigures highly desireable, and hense, the set as a whole, more impressive. Gimli is found in a total of 4 other sets, and this is the only version of Gimli currently available in full-size (micro-figure exhists). As Gimli is a dwarf, he has short, unbendable legs, like that of Yoda and other smaller characters. As seen above in picture 2, Gimli wears a dark red tunic with chainmail underneith. This is usually obscured with the luscious locks of beard hair. Contrary to many helmets of other knights or warriors, this helmet has been adjusted to be much shorter than others, in order to fit on top of his beard piece. Thus, normal helmets will not fit on his head. 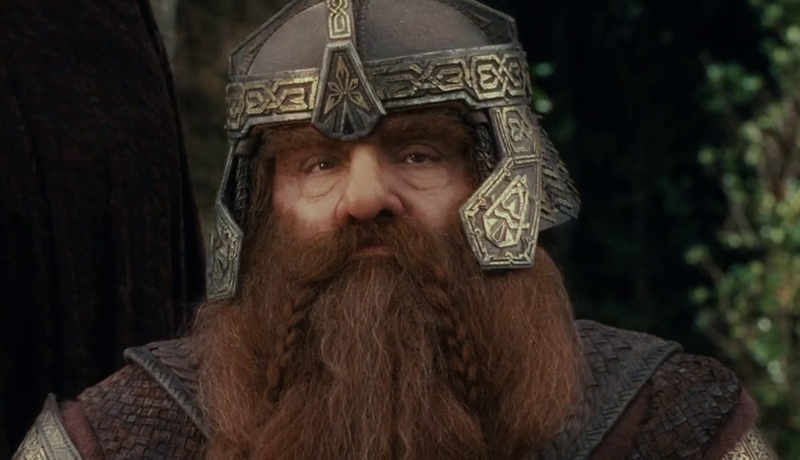 Gimli's helmet is remarkably movie accurate, as seen in picture 3. Gimli's face is double-printed, so of what little we can see over the beard, one side has a more battle-ready expression than the other. Since we can't really see the facial features of Gimli when his helmet is worn, I don't really understand the point of having a double-printed face, but I still like that the LEGO Company put it into consideration. Overall, I really like this minifigure for its accuracy. Legolas is possibly one of the most iconic characters in the Lord of the Rings movies, which creates really high expectations for the minifigure version. The printing on the torso and legs is done really well, and I think it works great to emphasize the Elfish-ness of Legolas and also shows the simplicity Legolas also seems to carry with him. My favorite piece in this minifigure is the hairpiece, because of the ears. It was very cleverly done, attaching it directly to the hair-piece, and matches well with the flesh-coloring we see in his face and hands. Legolas has a double-printed headpiece like most of the other minifigures in this set, but unlike Gimli, the face is a larger difference. This minifigure has a furious face on the opposite side, not shown above, and a grimaced mouth, which I prefer over this one, since it seems to encompass his ability to fight more than it would with passive features. Once again, this minifigure is done really well, especially the new printing and hairpiece. Aragorn, one of the most heroic characters in the story is done well, with a certain ruggedness about him, with earthy colors suggesting his status as "Ranger". Of the minifigures reviewed so far, I like Aragorn the least, because the torso and legs don't match in color, which is odd, and overally a turndown of the set. In addition, the torso and head don't match, because the small triangle on his chest is tanner than his face, which is another turndown. The face and hair are pretty accurate, which is relieving. Once again, this minifigure has a double-printed head, with a calmer expression on the opposite side. Overall, I'd give this minifigure a 5/10, since it is a poorly designed and printed minifigure, and overall not very appealing in comparison with other exclusive minifigures in the set. Next on the minifigure list is the Mordor Orc minifigure. Two of these figures are included in this set, but the figures themselves are identical (one is given a breastplate and sword while the other is given an ax). Overall, nothing out of the ordinary compared with other Orcs. It has a double-printed head, but instead of a face on both sides, hair is printed, which looks dreadful. I think the LEGO Company should have given this minifigure a helmet, and a more Orc-ish sword, like those in the Black Gate set and the Uruk-Hai in the Uruk-Hai Army set, because they look pretty boring in their brown outfit, and not very fearsome or threatening, where as the Orcs found in other sets are more authoritative and pose more a threat. Overall, this minifigure receives a 7/10. This minifigure is called the Pirate of Umbar, by the LEGO Company, and basically is one of the original sailors of the Pirate Ship, before it was taken by the Soldiers of the Dead. In this set, he is chained to the main mast, and has a two-faced head, one side fierce and ready to fight, while the other is fearful and panicky. Overall, a pretty nicely put-together minifigure, I like the torso printing with the belts and bands running across his chest, and his hair, which helps reinforce his pirate status. Since this is a generalization of the pirates, I think LEGO was especially good at summarizing the overall look of the pirates. The only think I feel is missing from this set is another pirate to accompany him, as it is pretty boring having only one pirate defend this ship while it is high-jacked by Legolas, Aragorn, Gimli, and the Soldiers of the Dead. Finally, the facial printing matches the rest of the minifigure, so I gave this figure a 9/10. Finally, we come to the Soldiers of the Dead, and their leader, the King of the Dead. I think TLG did a fabulous job on these minifigures, and am especially happy that they did not make the minifigures skeletons, and instead stuck to a traditional minifigure. There are only a few differences between the two soldiers, the torso and hand colors. Not much to say about that, though! Even though it seems that they have different heads, they are identical, it is just that the head is double-faced, so you can change their expressions...and YES, their heads are glow in the dark! The rest of the minifigure is not, unfortunately, even though the ribs and arms do look like they might glow. All three minifigures have identical leg pieces, which are printed nicely, and surprisingly fit well with each individual outfit. For the King of the Dead, he is mainly set apart with his crown and red cape, which are normally molded, but the face is different (glow in the dark), with more sinister and sly features. I don't like the torso as much as I do the Soldiers of the Deads' because you can see the through the rib cage and see the chainmail that he wears on his back. It just isn't very movie accurate, but other than that, the green tunic that he has printed on goes well between the torso and leg pieces. OVERALL, the LEGO Group did really well with these minifigures, espeicially with the exclusive ones, and overall, the print and design was done well and meets my expectations, so this set's minifigures get a 9/10. This set doesn't really come with any new or revolutionary pieces, the rarest being a gray wing piece that is found right behind the first sail, but on the bow of the ship. A nice touch by LEGO is a brick seperator, so if you don't have one already, it can be a very helpful instrument to work with, when disassembling your LEGO set. Overall, not very many new/exclusive/unique pieces, so I gave this set's pieces a 7/10, bringing the overall average for this part of the review to an 8/10. This set is a really nice set to own, really because it is from one of the greatest battles in the whole Lord of the Rings movies trilogy, possibly second only to the Battle for Helm's Deep in terms of epicness, though the Battle of Pellanor Field is greater in size and diversity in battle. In the movie, there are dozens of Umbarian Pirate Ships coming as Sauron's reinforcements, so it is possible to own more than one of this set, whereas for some other sets like the Death Star, Battle of Helm's Deep, or Tower of Orthanc, you can only have one. I'll get into more detail later on in the review. I have taken a look at the instructions manual, though I haven't personally built the set, and it is overall a fairly simple build for an AFOL, and it isn't extremely dense with new building technique. Overall, 9/10 as this is a really solid set, with a lot to offer as a build and for play experience. I personally think that this is a great set to part out. (The reason why I have my own pictures of pieces, but haven't built it yet is because I'm currently parting it out). The pirate ship itself can go for around $50, the Soldiers of the Dead for $23+, and the rest of the minifigures for another $40-ish, so in all, you can make fairly good money, especially since Amazon has had this set at below $80 time, and time again. You can probably make about $45-$60, depending on how long you are willing to let it sit on eBay, and what your initial pricing is. I picked mine up via Target clearance, where I was lucky enought to get it for $50, but I wouldn't look for more deals like that, since 50% off on a large set is hard to find, especially on a set as popular as the Lord of the Rings Pirate Ship Ambush set. Same reason why you never expect to find a Star Wars UCS R2-D2 on clearance for 50% off. Currently, I have mine up for fairly competitive prices, using Buy It Now or Best Offer, to hopefully draw people in. When you receive offers, don't be afraid to counter offer. A lot of the time, if you offer a good explanation of your pricing, the buyer will get a bit close to your target price, or even take it. Just don't offer so high that it drives the buyer completely away. At the time of this article, only the first 3 lots have sold. Next to them I have the price they sold at in bold after fees and shipping costs. That brings the total to $75.13. I will probably get an additional $30 from the additional minifigures after fees. Some advice, list the minifigures with free shipping! That is a big draw and might help a buyer choose you over another seller. I also have my listings on duration of 5 days, rather than Good Til' Cancelledbecause it gets more views from buyers who sort by "Ending Soonest" and "Newly Listed". It adds a little more visibility and possibly put some pressure on the buyer to act fast! Just make sure to keep your prices competitive, or else the timeframe your listing is ending at won't matter! Overall, this is a pretty good set to part out because it is easy to get for $70-$80 right now, though there are definitely some sets that can be parted out at better margins. Lord of the Rings is one of the more popular themes of LEGO products, and a lot of that has to do with the overwhelming response to the trilogy of movies that have just recently been released. LoTR (acronym for Lord of the Rings) has many similarities to the Star Wars franchise. A series of 6 or so movies, that shows the epic journey of two different individuals that are related by blood (Luke Skywalker & Anakin Skywalker/Darth Vader, and Frodo Baggins & Bilbo Baggins). Unfortunately, I don't think that LoTR will last as a LEGO theme as long as Star Wars, primarily because LoTR is based on books, and so since there isn't any new material to write about after the Hobbit is completed, then it is likely that its popularity will go downhill from there. Star Wars on the other hand was created specifically as a movie, and has much more freedom to expand upon, partially because it isn't restricted to a book's storyline and plot, but also because there are many more heroes to tell stories about than the LoTR theme. Not saying that such things won't happen, since I definitely won't rule out the possibility that LEGO would do something similar to the Expanded Universe portion of LEGO Star Wars with characters and plots adopted from video games and fan's ideas. I'd say that the theme will die out within 4 years of the last Hobbit movie, but for the next 5 years, I think the Lord of the Rings theme will be a strong competitor in the realm of LEGO investment and popularity. There will likely still be a large following though and a positive secondary market because of the sheer number of followers of the Lord of the Rings and the Hobbit. This set isn't exclusive to any country or store, and is commonly available for 25+% off, so nothing outstandingly special in terms of production. I really like the box art of this set, because it does a great job of showing the size of this set, though the sails seem to take up a bit too much of the picture. The picture doesn't hide anything, and shows all the cahracters in full armor fighting, which does a great job of drawing in customers. It was also a nice touch by the LEGO Company to include a picture of a ship in the background possibly suggesting the customer buy more than one to create a fleet. Like most LEGO sets, on the top it shows a picture of a piece or minifigure to show the actual size, and I think LEGO did a great job choosing which one to put, because they placed one of the most expensive figurines on the top flap, the King of the Dead. On the back, we get normal action shots of the catapult in motion, flick-fire missiles, etc. A subtle addition by LEGO is a map of Middle Earth, with places labelled like the Shire. I'm not sure how common this is, but this box has flaps on the side that you can punch out to reclose, a lot like the ones on cereal boxes, which is helpful if you are going to display the set and flatten the box, then after a while, put it back into the box. These flaps are strong enough to open and close easily and more than once. The only downside for this packaging to me is that the sails take up too much room on the front, which kind of blocks out the more interesting pieces of the set. Finally we can compare this set to similar ones in the same theme that have already retired. I'll compare this set to 9474-1: The Battle of Helm's Deep, 79010-1: The Goblin King Battle, and 9473-1: The Mines of Moria. Based on these values, the future growth for the Pirate Ship Ambush is not looking good. All three sets have been retired for about 5 months, yet only one has a positive CAGR. This is primarily due to the fact that both the 79010 and 9473 sets were widely available at large discounts, over 50% off in some cases. So, as expected, it takes some time to rebound to a more normal secondary market value. Looking at their change in value over the last 6 months, however, we see much more promising numbers, with huge gains over the last few months, which shows some optimism for the 79008-1: Pirate Ship Ambush. I'd expect this set to hit $150 no problem after retirement, probably within a year of its retirement, and hit $200 within two years, which isn't terrible for a long term investment. Though this may seem lower than many of other sets, it is due to the fact that this set is widely available for under MSRP, and because the eBay/secondary market is very saturated with LEGO sellers, making prices more competitive and as a result, making it much harder for prices to rise. Since the Pirate Ship doesn't play a huge role in the film or books, I'm not sure how popular it will be when compared to other LEGO LoTR sets like Tower of Orthanc, but it does appeal to Boat/Ship LEGO fans, which could help boost it in value with great details in the ship. I think this is a decentdisplay set, since it takes up a lot of room, but not as much as some of the other ships, i.e. Imperial Flagship or the Black Pearl, but still a large and attractive ship. Alot of the important and stylish details that we get from this set are small and sometimes hard to see, which is somewhat of a negative of the display value, but we do get really nice recognizability for this set. Overall, I gave this set a 9/10 because of the following pros and cons. The LEGO Star Wars 75017-1: Duel on Geonosis set isn't a large set, so when I first heard about/saw this set in pictures, I dismissed it. Though it does lay in the top 10 largest LEGO Star Wars sets released in 2013 (only normal production sets included, excludes 3-in-1 super packs), it retails for $39.99 and has 390 pieces, making it rather average in size, but underpriced, in my opinion. This set leaves much to be desired, and reminds me quite a bit of the Rancor Pit set, with a lot of open space, and minimal interior. If anything, this set is to part out, with fairly attractive colors (brown and gray), which can sell more than other colors like blue or red. As a stand alone set, on first impression, this set is terrible!! It has nice decor, but is missing the action and bright color needed to draw builders, especially young builders, to the set. Along with the Mos Eisley Cantina, I think the duel between Count Dooku and the 3 Jedi, Yoda, Anakin Skywalker, and Obi-Wan Kenobi is one of the more iconic scenes that hasn't been made extensively by the LEGO Group. Now, without further adieu, a review on LEGO Star Wars 75017-1: Duel on Geonosis!! This mold is found in 19 other sets, making it rare, though it is not highly sought after because of its size. This piece would be extremely practical for paving sidewalks in city landscapes (especially helpful when you are trying to connect larger baseplates together), and could be used in the construction of LEGO houses. Once again, however, this piece can be used in place of several flat tiles, but this doesn't work vice versa, which makes it impractical in some circumstances. In this set you get quite a few harder to find colors, such as dark brown, and a few 'castle' pieces in hard to find shades of gray, which is nice to part out, but the molds are very typical. As a result, not a great set to part out, but some nice colors for MOC's (My Own Creations), and a low price, if you need the pieces. There is a total of 4 minifigures in this set, 3 of whom are exclusive to this set. This particular version of Yoda, Count Dooku, and Poggle the Lesser (first and only version) are exclusive to this set, and the FA-4 Pilot Droid minifigure is found in one other set. The new version is on the left, while the old version is on the right. This new version of appears to have a different torso printing as well as a redesigned head. The torso compared to the one released prior is fairly similar, mainly with slightly different wrincles in his robe. The new version does have a slightly greener robe and legs, which are short, and unbendable. There are larger differences in the head. There is a new mold for Yoda's head, as seen above, and one of the main differences is the ears, which are more curved, and have a more organic appearance rather than the straight ears of the older version. We also have a more circular head, which I think is a bit more movie accurate, since Yoda's head was never very wide in the first place. There are also some facial differences, like smaller eyes, a larger mouth, as well as a higher nose in the new version. Over all, I think each minifigure serves for a different purpose. The older version looks like a minifigure out of the Clone Wars TV show, making it accurate if you are referencing it to the show, but if you are referencing to the original blockbuster movies, the new Yoda is more accurate. This version of Count Dooku is exclusive to this set (right-new, left-old). Once again, we'll do a comparison of Count Dooku minifigures. Once again, we see that the older version is much more accurate in terms of the Clone Wars TV show, which had Dooku younger than the age that he appears at in Star Wars Episode 2 (Attack of the Clones). The new version is much more movie accurate with the facial structure, and hair. Both minifigures include capes, identical legs, but slightly different torso pieces. There is a more prominant outline of Count Dooku's body in the Clone Wars version, but whether you like that or not (or care at all) is up to you. Unlike the old version, this new Count Dooku has a double-sided face, one with a more neutral look, and the other with a more ferociousness to it. I also like the new version of Dooku because its more movie accurate, and basically looks more accurate. Thus far, there hasn't been a version of the FA-4 Pilot Droid who piloted Count. Instead, in 7752-1: Count Dooku's Solar Sailer, we have a normal looking white droid, as seen above on the right. The new version is made up of 9 pieces, waist up looking like a normal Clone Wars era droid, but below the waist, is a stand, which is a brickbuilt version of treads which the droid in the movie used. This is the only non-exclusive minifigure in this set, and it is found in the 75023-1: Star Wars Advent Calendar (2013 Holiday Season), but this set had a fairly limited shelf time period, so this minifigure is still fairly uncommon. To be honest, there isn't much special about this droid. "These are not the droids you are looking for." This is the first ever minifigure version of Poggle the Lesser, one of the Geonosians that you might remember from Attack of the Clones. He is eventually killed on Mustafar by Darth Vader, along with a number of other Seperatist leaders. The head mold is new, and over all, I think the LEGO Group did a fantastic job of recreating the original Poggle the Lesser, as seen right of the LEGO minifigure. The minifigure comes with a set of wings, which can be found in a number of other sets that have Geonosian soldiers/pilots in them, but this one has different colors. The torso and legs are both unique, and if you compare them to the image at right, they are extremely accurate. You can clearly see the bronze-colored breasteplate of Poggle as well as his decorated belt hanging from his waist. The only thing that I think is missing from the minifigure is a staff for Poggle, since I think that is a fairly important part of the minifigure. I haven't built this set yet, but it is designated for 8-14 year olds, so I assume it is a fairly advanced set. It does look fairly simple though, and I think ages 6-7 would be able to put the set together with a little asistance. There is a great amount of detail that goes into a set like this, and you can really see it when you look at the walls of the structure. There is a lot of great texture, using bricks that are less commonly used as walls, and I think it really helps to accomplish the jagged cave walls look. Also, if you look at the doorway, there's quite a bit of nice detail, at the peak of the arch, especially in the lamp that hangs from it. In addition, there is a brown colored column that can fall, if you lift the lever that is found at its base. You can find the function in motion on the box. There is also a landing platform right outside the doorway, though it isn't that easy to see in the pictures, which is a nice touch, but the speeder of Count Dooku is really only big enough for the Count, and there isn't enough space to have the droid there, even if it was by itself. Makes it a bit confusing to have it the pilot droid included in the set. There is some nice details on the speeder (keep on mispelling that "speedor" after CHIMA Speedorz! ), like the acceleration pedal, stability fins on the side, etc. There is also a clear brick connected to the underside of the speeder to give it the illusion that it is floating. As seen on above, here is the breakdown of the price per brick of this set, for on NEW (based on latest eBay NEW prices), USED (based on latest eBay USED prices), and RETAIL (based on the original MSRP price of the set). For the US, we have a PPP (Price Per Piece) ratio of $0.10, which is really good for a SW set, though the current trends seem to be suggesting that LEGO Star Wars Price Per Piece ratios are going down, in effort to boost appeal to customers. At 390 pieces and looking at the set on the other hand, you don't really get much. Just a bunch of "rock" pieces, which could be found in dozens of other sets. I wouldn't buy this set for full price ($39.99 USD), seeing as it is going for nearly half that on eBay, and will probably only appreciate to $50 once said and done with. I wouldn't part out this set because the only highly appealing part of the set is the minifigures, and you might just break even, and probably wouldn't make much more than that unless you bought the set dirt cheap. Star Wars is one of the most popular themes ever to be produced by the LEGO Company. Getting ahold of the Star Wars license was largely an experiment on the part of the LEGO Company. The LEGO Company was struggling to find an area where they could concentrate on, while still make large enough profit margins to stay in business. The cost of molds used to produce elements, as well as the increasing number of elements being introduced increase costs. In fact, in the year 2000 alone, around 8,000 different elements were being produced EACH YEAR. (that number peaked at 14,2000 in 2004).They wanted to stay with their long-standing motto of “Only the best is good enough” and traditional brick-and-stud configurations, but at the same time, modernize the company to “stay in the game”. It’s during the time period of this set that infamous LEGO failures were introduced, including LEGO Galidor and LEGO Jack Stone. Star Wars luckily, was not on the failure list. Whether or not to take a hold of the Star Wars license had already been a highly debated subject within the LEGO Company, and had it failed in the first 1-2 years, it would have been removed from production. In fact, in early 1997, when Star Wars was first proposed as a possible LEGO theme, the LEGO Vice President said rather harshly, “Over my dead body will LEGO ever introduce Star Wars.” Little did the head LEGO employees in Billund, Denmark know that it would save the LEGO Company, and help to form it into the LEGO Company we know today. Source: Robertson, David C. “Brick By Brick.” Crown Business, 2013. This set was first available in August 2013, so we can expect at least another year out of this set, and I would guess that we will be eventually seeing this set at a very cheap price in the future. Don't rush to grab this set yet, just because you don't have it! At the time of the writing of this review, there are many other alternatives that are much better to invest in, and are much closer to retirement. Look at sets that were released in 2011, as those sets will likely retire within the next few months, or even 2012 sets, since they will also be off the shelves soon. This set's packaging is pretty normal for a LEGO Star Wars set. The top right logo is mandated by LucasFilms Star Wars, and you can find this logo on all 2013 Star Wars sets, not just LEGO (graphic changes annually to a different image/character). We see in the middle left a normal info panel featuring general information like suggested age, and piece could which is nothing new. In terms of the concept behind this box design, I think its pretty good, because it accents the most attractive part of the set: minifigures! Over all, I give the box design a 6 because it is above average, but the set itself brings down the appeal of the box. I think this set won't grow a whole lot even though it represents a large and important part of the Star Wars saga, because it is just visually lacking. There is a lot missing, and I think LEGO could have done a better job with the set design. Star Wars hasn't been as strong a performer as it was, say in the 2005-2009 range, with too many remakes damaging value of older sets. Though this particular set isn't a remake, I think the sheer number of repeats has already pushed away a multitude of fans (of the LEGO product), and though there is still a strong LEGO Star Wars following both AFOL's (Adult Fans of LEGO) and in children, I think this isn't on the top of the priority list, and probably won't be very sought after once it retires. Like said before, this set is really lacking, with a lot of empty space, and not a lot of the factors customers, especially kids, look for in a LEGO set. Sure, you can have Yoda and Count Dooku fight, but the set is structured in a way that it seems like a huge waste of bricks to have what the LEGO Group has designed, if that makes sense. In general, medium to large sets are better displays than small sets, because they are more physically attractive with more detail, and more eyecatching, and I think this set would fall under the description of small sets, dispite being a 400 piece set. Overall, I wouldn't recommend buying this set, unless you are a completist, or really enjoyed the Attack of the Clones movie. Very low price per piece ratio. High price point for what you receive. Thanks you for reading my review on the LEGO Star Wars 75017-1: Duel on Geonosis set!!! I first came across the 7155 Trade Federation AAT while searching through the BrickPicker database for remakes of Star Wars sets. This particular one didn’t really stick out to me, but 1999-2001 LEGO Star Wars sets have always interested me, as they had great Price Per Piece ratios and were the pioneers of the theme that helped rescued The LEGO Group from bankruptcy. The most recent time that I’ve come across the 7155 AAT was when I acquired this set from a relative. At first, I was mildly disappointed because I had wanted a newer set, but then after digging into the building of the tank, I began to enjoy it, and appreciate it way more than I had before. This set plays a fairly large role in both the Star Wars The Clone Wars TV show, as well as several of the Prequel Episodes of the Star Wars saga, notably the Battle of Naboo. Though it obviously isn’t as “big” a vehicle as the iconic Millennium Falcon or Death Star, it plays a large enough role to draw buyers over a decade after its retirement. To most readers, I would hope that this piece is familiar. This particular mold is found in 27 sets, a relatively low amount for a piece, but is often used in Star Wars sets. This particular color variant is found in only 1 set, that being the 7155 AAT. This piece has a variety of uses, and is one of the few pieces that can attach to studs on a conventional LEGO brick in two directions. One is located on the longest side of the piece, with 2 lines of 2x1 receiving ends of the stud, and on one end has a receiving end that will stick to a 3x3 stud surface. The opposite sides uses regular studs. This piece is found right below the droid gunner’s cockpit and they are in a 45 degree position. This piece is found in only 2 sets, both being released a while ago in 2000 and 2001, respectively. This piece often reminds me of the foot of a AT-AT walker, though to my research, has not yet appeared in a official LEGO AT-AT. This piece acts as the cover for the Droid Gunner’s hatch, and is attached to Brick 1x2/Firc/Fork Vert./End (http://brickset.com/parts/?part=4144501) which allows for the hatch to open and close. It isn’t easy for it to do so, though, because the hatch isn’t connected to the hinge brick in any way other than being stuck to the bottom of the piece, so it falls off very easily. Though a familiar sight to both non-LEGO and LEGO fans, the Battle Droid has quite a bit of little-known history behind it. Contrary to more recent variants of the Battle Droid minifigure, this variant has 2 identical arms, both with hands that are positioned parallel to the ground. In 2007, a new type of arm was introduced to the Battle Droid, which allows the minifigure to hold a blaster “correctly”. This minifigure sports 2 identical hands. This piece is unique to this set, along with its mirror image of the same piece. It makes up the “hull” of the AAT, and majority of the base of the tank. Though this piece does have studs in the middle, in the 7155 Trade Federation AAT, no pieces are ever connected to them. This set took me about 20 minutes to put together. It is probably buildable for most 7 year olds, but I could envision this set on the desk of an AFOL (Adult Fan of LEGO). This set doesn’t really include any unique building techniques, but does cleverly use some flat tiles in the construction of both cockpits. At the beginning of the construction of this set, I was pretty confused with the 4x8 tiles, and what was “right-side-up”, but besides that minor confusion, it was a fairly straight forward build. This set only weighs about 7.8 ounces, which makes it a great option for younger kids, and is very sturdy. Upon giving this set the “Drop Test”, this set broke into 2 main parts: the cockpit of the gunner and cannon, and the body of the tank. I thought that this was pretty good, as it was fairly self-explanatory putting everything back together. Upon release, the 7155 Trade Federation AAT sold for $19.99, and with 158 pieces, it had a Price Per Piece ratio of about $0.13, higher than some of the other sets it was released alongside. Let’s look at a comparison with the 10 other Star Wars sets that had debuts in 2000. The Price Per Piece ratio for this set is largely justified in my opinion. Two very large pieces that make up the hull of the AAT are much more costly to manufacture than, for example, a 2x4 piece. In addition, two 2x16 pieces are located under the hull, increasing production costs. To my knowledge, the 7155 Trade Federation AAT was only released in the United States, and was a non-exclusive set, meaning it was sold at virtually every LEGO retailer. This set was relatively popular, which is shown through eBay sales. An average of 13.25 units of the 7155 set are sold on eBay every month in both new and used condition. As you can see, this set features a fairly contrasting box design, with a black stripe across the top with the iconic LEGO logo and the Star Wars Episode 1 logo, symbolizing release wave (each wave has its own unique symbol). The majority of the front of the box is occupied by the tank, looking pretty yellow in this picture, but actually more tan. The background shows that this tank is on Naboo, with some of the iconic buildings with large windows and greenery in the background. I really like this box because it keeps the focus on the AAT without having very much additional special effects, save the blaster-shots streaking across the design. As you can see, there was a fairly nice sized jump in value from November 2012 to December 2012 of $16.85, pretty decent in my opinion for a set a decade year old. As of the last six or seven months, it looks like the value has stabilized with normal variance of value. I wouldn’t expect much change in value to come, especially in the positive direction, as there is a newer remake which has a NEW value lower than that of the 7155. I currently have this set on display on my window sill, and I think it looks great. It doesn’t take up a lot of room, and is a relatively short build, but the iconic feature of this set is unmistakeable. Though it doesn’t have as many moving parts as some other sets, it has a high enough number that you can make several unique displays, and don’t forget to use those minifigures!!! A little short, which limits some of the display quality. Prior to Series 9, I had never set eyes on a single Collectable Minifigure package in person. Eventually, I made a much needed visit to the LEGO store, and bought a few Series 9 figures, noteably the Chicken Suit Guy. A few weeks later, I made a second trip to the store and started on Series 10, which everyone knows is the series that includes Mr. Gold. I wasn't out so much to get Mr. Gold, as I was to get some other minfigures, like the Grandpa, and Roman Commander. As I had picked up CMS collecting at Series 9, I couldn't get the Roman Soldier from Series 6, so I decided to settle for the Roman Commander. Let's just say that I was not at all disappointed!! The closest minifigure to the Roman Commander is its counterpart, the 8827-10 Roman Soldier. The similarities are much more obvious than comparing other minifigures to the Commander, but still when comparing the Soldier and Commander, there aren't very many similarities. Though the similarities and differences are negligible, both could be seen as Roman Soldiers, but I think that the Roman Soldier cannot be used as a Commander because using a shield represents that the bearer is a footsoldier. For commanders, on the other hand, swords are primarily used for show of authority and skill. I will point out, however, that the sword of the Roman Commander is flexible, rather than being hard plastic, but it does maintain its shape. The cost of CM's are pretty expensive, a lot of times coming out to be $0.50 per piece, but I wouldn't worry too much over this because there isn't really compettition within the LEGO world to these, so you can either get the set or not. The CMS theme is one of LEGO's most popular homegrown themes, and has been growing because of the search for the elusive "Mr. Gold" minifigure. Though popular, I have found that many stores around me do not carry these as well as other LEGO products in favor of other building sets such as Mega Bloks and Lincoln Logs. I'm sure that this isn't the case for many of, but this is what I have found for my local stores. This is not really exclusive, in that it is available fairly widely, but it is sometimes difficult to "feel" for him, which makes him more sought after, and overall more valuable. The packaging on this set is a nice yellowish-golden color, which is fitting, as the Series 9 bags were silver. The bags are most likely golden because it is a possible host to "Mr. Gold". Besidse this, however, I don't see anything outstanding about it. As usual, the bag does show the 9 most common minifigures in the series, including the Roman Commander. Many people [including myself] were surprised at the quantity per box of the Roman Commander because the Roman Soldier had been among the rarest in the series, while the Commander is more common. I am very confident in the return of this particular minifigure because he is part of an "army builder", which means that you can you can have a lot of these guys. I think that his value will be similar to that of the Roman Soldier, or even higher, because of his role in the army, that is more important than that of a soldier. The Roman Soldier is worth $9.73 according to BrickLink.com, so I think that the Roman Commander will eventually reach $10 and higher. One of the things with Collectable Minifigures is that you have to search for them, and since Series 10 is also home to Mr. Gold, more people are probably looking for Mr. Gold than the Commander. Once demand for Mr. Gold lessens, and Series 10 is retired, the Roman Commander will probably have been overlooked, and therefore in higher demand. CM's are meant to be displayed, as they come with a decently sized baseplate that keeps them fairly stable, but at the same time, doesn't take up a huge amount of space. I think that the Roman Commander is a better display than the Roman Soldier because he has a cape, which adds a little more drama to the display, and he has the plume on his helmet, which makes him more recognizable and stands out, since it makes him slightly taller than other minifigures. Like most of the CM's that I have reviewed thus far, I feel pretty good about it. I have already sold 3 of these minifigures in a lot for a total of $15.99, which means that it is about a $2 profit after fees, which I thought was pretty decent for a minfigure that has not retired yet. Upon retirement, however, we should eventually see this minifigure at $10+ a piece, if my estimates are correct. There's still plenty of time to pick up this guy, because Series 10 could have the longest production run of all series because of Mr. Gold, and the hunt. My theory is that as long as there is a substantial amount of Mr. Gold's not found, The LEGO Group will continue to produce and sell Series 10 minifigures. The 7929 Battle of Naboo contains 241 pieces and is meant for ages 7-12. It contains 4 variants of minifigure: (1) Jar Jar Binks, (1) Gungan Soldier, (2) Droid Pilots, and (8) Battle Droids. I gave this set a “10” for First Impression because it was one of the first sets I bought for investment, and when I first started investing, I picked sets that I was nearly 100% sure would increase in value. I also wanted a set that I had already previously built and played with, to make sure that it was “playable”. Another big reason why I chose this set is because it includes a whole load of droids. This was my 3rd Star Wars set I ever owned, so I had a negligible Clone Army no Droid Army, so I bought this set for the high volume of droids included. This set includes pretty commonly found pieces, as well as the minifigures. Jar Jar Binks is found in 1 other set (9499 Gungan Sub) and the Gungan Soldier is found in 1 other set (9509 Star Wars Advent Calendar). This set does include its fair share of gray pieces that could be used for selling in a “lot” and the tan pieces are harder to come by. To me, this set is like a mini-MTT, which is a massive Droid transport ship. The ship can move around using 6 4x1 ski-like pieces that allow for it to slide around. The build is not very complicated, and because the set is symmetrical, uses a deal of repetition. This set took me about an hour to put together when I was 11 years old on Christmas morning. This is perhaps one of my favorite medium sized sets, because you can have a full fledged battle. You can also make the Pilot Droids unload the Battle Droids, as well as have the transport double as a battle tank!! There is a little flaw with the design of the front cockpit of the Droid carrier though. Often, when repositioning the Pilot Droid, the front armor of the carrier falls off since you have a mere 2x2 space allotted for doing this. He has to move around sometimes right? 7929 The Battle of Naboo retailed in the USA for $24.99, giving it a Price Per Piece ratio of $0.10 per piece at regular retail. This set is far from an exclusive set, and is sold in relatively high amounts (for a LEGO set) with 32 sets sold in May 2013. For “Parting Out” this set (selling individual aspects of the sets separately), this set is pretty good. Coming from Star Wars, this set has a very low Price Per Piece ratio, many having ratios as high as $0.13 and up! A bargain for sure which is partially the reason why this set has been so widely bought and sold. Also, as I stated earlier, this set is an amazing army builder for the Droid Army! LEGO Star Wars is one of the biggest, bestest themes that TLG has around. For investment, many medium sized sets are meh, but it still has a very, very large fan base. After a poll here on BrickPicker, more members picked LEGO Star Wars as their favorite theme over any other, which says something. Also, by walking down your local Target or LEGO reseller, take a note of how much space Star Wars takes up in relation to other Lego themes. I have found that SW takes up approximately half of the LEGO space on shelves, the other big dominators being Super Heroes, Lord of the Rings, and LEGO City. I believe that this is due to the relatively large Star Wars fan base, that keep the theme running. Though this theme may be dominated by adult fans and older teens, it is popular never the less, and I believe that it will continue to do so until a few years after Episode 9 of the Star Wars movies is release. Nothing really exclusive about this set, it is found at pretty much every retailer of LEGO bricks, because of its popularity as a theme, a set, and as well as its affordability. The box of this set is made out of the tougher cardboard that is found on many larger sets that cost upwards of $20, and continues to $400 sets, which means that it is very durable. I have kept this box intact in order to store the instructions of smaller set, since it is very durable. Though I have handled this set for 2 years, and the box has had its faire share of wear-and-tear, it could still pass as a set found fresh from a box straight from TLG. The box design is decent, but not outstanding. On the front is a blue Clone Trooper, who is the logo for the year and time of year that this set was released in, and has a small box with each of the minifigures displayed (not including repeats), as well as the set as the main cover design , with Naboo in the background, with ATT Droid Tank’s and MTT’s in the background. On the back is the customary LEGO design with pictures of 3 other LEGO sets released in the same wave, as well as a breakdown of the set, what you can do with it, and a 360 degree view of Jar Jar Binks. This set has already been retired for around 7 months, but saw a very nice jump in value after 2 consecutive months of loss, approximately $4 each month. In the month of May 2013, this set jumped up a very impressive 25.18% to $30.38, which is up 21.57% from retail. We had a steady increase from August 2012 to February 2013 ($19.53 -> $31.07) then a dip, and then a rebound, which is not a huge shocker, because if you compare the Sale Trends and Number of Sets Sold, the graphs roughly correlate with each other, including the spike in sales in May. Please see the graphs below for more details! This set is a decent display set, though it lacks in size and impressiveness, it has its own sort of beauty as a set because of the nice curves of the ship. There is also something uniform about this set which is also really cool. This set can be used as a display because it features both sides of the battle: Gungans/Republic vs. Droids/Separatists. It can also be moved into a very big variety of positions that can make the display unique from ones that others might have. To me, this is an amazing set as a build, though as an investment, it has not been outstanding. As an investment, its performance so far gives it an 8, but as a build, I am giving it a 10, which averages out to a 9. I think that in the future, we can expect this set to be a $40 set, probably around Christmas time this year. Though this is a bold statement, seeing where the set is currently as well as in the past, I think with the Christmas rush of buying, it will make it!! I first saw this set a few weeks ago at the back-ends of a Target aisle. There were around 30 of these on a rack hanging, each with a permanent marker mark through the bar code and a sticker reading "AS IS" and a price below it. I was able to get this one for very cheap, each costing $1.07 (I bought 10). So I was very happy since the Harry Potter theme has been long retired, and it is a treasure to be able to pick up any set in the theme for MSRP. Lower is even better!! This minifigure has appeared in 7 other sets: 4736 Freeing Dobby, 4738 Hagrid's Hut, 4842 Hogwarts Castle, 4865 The Forbidden Forest, 4867 Hogwarts, 852983 Harry Potter Magnet Set, and 30111 The Lab, so as you can see, this particular variation of Harry Potter is not extremely rare. Harry Potter has black shaggy hair, a flesh-colored head with circular glasses, a smile, a dimple right under his smile, eyebrows, and his classic "lightning" shaped scar in the center of his forehead. His torso is printed and has a classic Hogwarts School uniform with a tie, dress shirt, and sweater. On the back of his torso you can see some creases in his shirt and the continuation of a golden colored belt. He also has flesh-colored hands. His pants are just regular gray pants that match his torso piece. The second creature in this set is the spider. Though not an official minifigure, I will review it here. The spider comes in 49 other sets, and is by no means, rare or sought after. He has a single hole on his underside where he can attach to a regular LEGO stud, and a "mouth" piece that can hold a pole or stick. The build doesn't have any pieces unique to this set, though cylinders are tinted in colors that are less common. The build is really just a shelf that holds potions. Each tinted container has a golden stud cover which is a nice touch. In total, there are 5 potions. This build takes about 2 minutes to build, and is by no means tough to make. You can play with it to a certain extent, but this set only coming with 1 minifigure really drops the playablity factor of the set. There aren't very many things you can do with this set, especially with very few moving parts, though Harry Potter does have a brown wand which could be used to play with also. Nevertheless, this set is still is a nice while it lasts. The Price Per Piece ratio of this set is $0.12 which is right around regular for the Harry Potter theme, and a little below average for a small set such as this one. However, I do really love this set because the minifigure. The minifigure is pretty nice. Who doesn't want more Harry Potter minifigures? This is probably one of the most popular retired themes out there, right on par with Bionicle. It isn't that the sets are popular because they have increased in value. In order to increase, there has to be a higher demand than supply which is for sure the case here, as the theme's average CAGR is +16.32%, and for a set with only 59 sets, this is very impressive. This set is fairly exclusive, only available at Target, but I do believe that a large amount of these sets are currently out there, many of them in the hands of investors, which could lessen their ROI. According to brickset.com, this set was only available in August of 2011, though I believe that information is incorrect. This set comes in a polybag of average size, on the front we have a printed red seal with the Hogwarts seal, in the upper right there is a picture of Harry, Hermoine, and Ron, the 3 stars of Harry Potter films and LEGO sets. The back does not really have anything special on it. This is my first time using charts in a review, so please bare with me. *Set was only available at TRU in August 2011 according to http://brickset.com. You might look at the "Change in the Last Month" column and see that the 40028-1 Hogwarts Express and 30110-1 Trolley have both decreased in value, but this partially due to the fact that since they have such low current values, fluxation in pricing by a mere dollar can lead to large percentage changes. However, by looking at the data, you can tell that both the 40028-1 Hogwarts Express and 30110-1 Trolley have nearly doubled their value, if not more. The 30110-1 Trolley doubled in value probably because of its high TRU markup, as well as low piece count, which directly results in a high Price Per Piece ratio. By looking at the so-far growth patterns of this set, we can see that this set is increasing rapidly especially in the last 3 months. This set was only available in November 2011 according to http://brickset.com, which is somewhat puzzling to me why I was able to find this more than a year and a half after it was supposedly retired. Probably it was available for a lesser period of time, and probably retired around december from most Target locations, to whom this set was exclusive to. This set could be used for display, and would be useful if you are a big Harry Potter fan and want to display small scenes from the movies...in LEGO form. I don't think that if a guest were to come over to your house, would they inquire or start a conversation about LEGO's. They might smile, but it doesn't really stand out, partially due to its size. I believe that this set will eventually be worth over $9, probably surpassing the 40028-1 Hogwarts Express and 30110-1 Trolley very, very quickly. Though not an outstanding set as a display nor as a build, it is still a nice little set to own.